Concussions, considered a type of mild traumatic brain injury (TBI), are increasing in incidence in both adult and pediatric populations.1,2 Concussions can occur as the result of motor vehicle accidents, falls, occupational accidents, recreational accidents, and assaults. 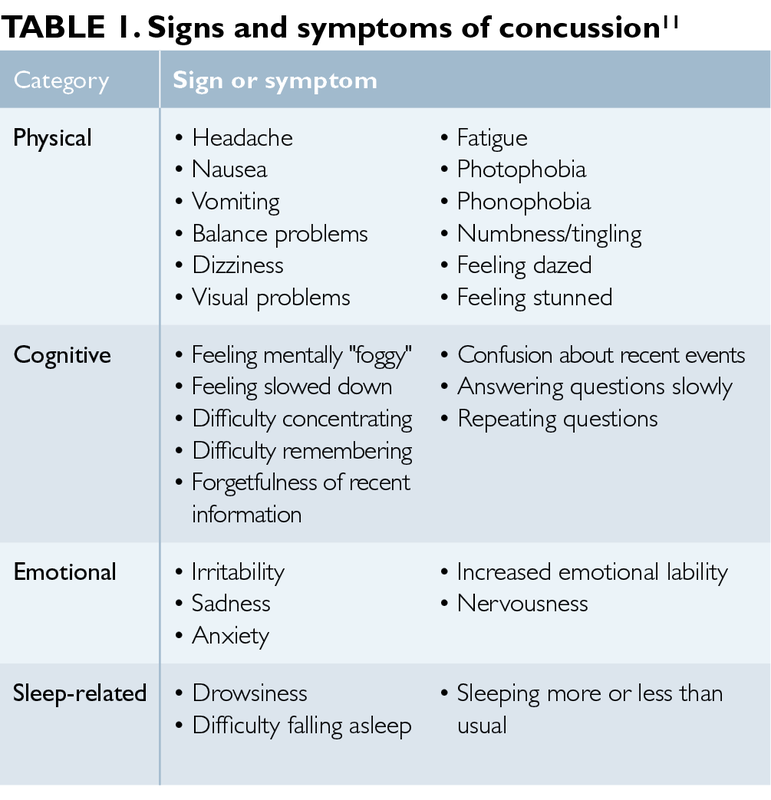 The Centers for Disease Control and Prevention (CDC) estimates that between 1.6 and 3.8 million concussive injuries related to sports occur in the United States annually.3 As the number of emergency department visits for concussion-related injuries increases, so does the demand for primary care providers competent in the evaluation and management of concussions during both the initial presentation and clinical follow-up. Which of the following best describes your opinion about sports concussions? Most patients with a concussive head injury can be managed safely in the outpatient setting. Observation with a responsible caregiver is recommended in the first 24 hours after an injury because of the slight risk for an intracranial complication.13 Admission to the hospital is typically recommended for patients with any of the following: (1) Glasgow Coma Scale score <15, (2) abnormal findings on CT scan, (3) seizures, and (4) abnormal bleeding parameters due to an underlying disorder or oral anticoagulation.14 A patient with an uncomplicated concussion is typically educated about the need for physical and cognitive rest for at least 24 hours. Certainly, this period can be longer if the patient remains symptomatic or the severity of the symptoms warrants continued rest. Cognitive rest is especially important in children and adolescents and should include abstaining from activities such as playing video games, watching television, working on a computer, using tablets and smart phones, listening to loud music, reading, and engaging in mental exercises requiring focus and concentration in the academic setting.15 This period should be followed by a gradual return to work, school, or physical activity, depending on the patient.4 Again, it is important to note that the majority of patients with concussion-related injuries typically recover spontaneously over several days.